The Cambridge Preparation for the TOEFL® Test, Third Edition, includes skill building and practice tests all in one volume to help learners succeed on the Test of English as a Foreign Language. 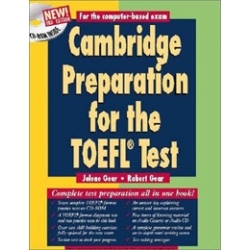 The third edition of Cambridge Preparation for the TOEFL® Test provides a complete tutorial and a wealth of new activities to introduce students to the new computer formats and activity types. Other key features include more than 200 skill-building exercises fully updated for the current exam, six hours of listening material on Audio Cassette or Audio CD, a complete grammar review, a CD-ROM component containing seven complete practice tests, and an in-depth mini-writing course.